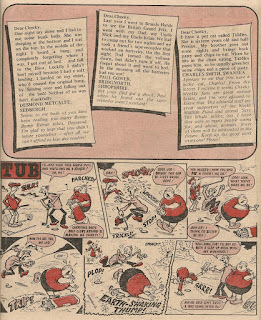 Irmantas has posted an interesting article on the Maxwell Hawke strips from the Buster Annuals. 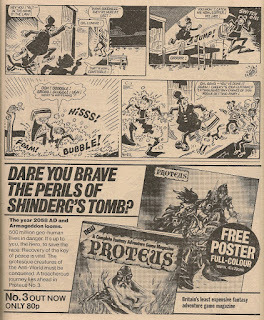 As you may recall, the first James Bold serial that was printed in Cheeky Weekly, 'Fangs of Fear', was based on the original script of the first Maxwell Hawke story to appear in Buster, 'MH and The House of a Thousand Secrets' (29 October 1960 to 04 February 1961). The Cheeky Weekly version used new artwork. 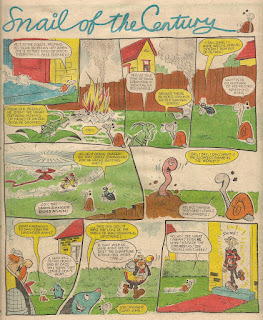 Apparently the final James Bold tale to appear in Cheeky Weekly, 'Island of Fear', was another re-drawn MH script, this time using the plot of 'MH and The Isle of Ghosts', which ran in Buster from 07 March 1964 to 09 May 1964 (thanks to alanultron5 from the Comics UK forum for the info re Isle of Ghosts). I've always assumed the other James Bold stories (there were 5 series in all) were also based on MH scripts. ...and I can report that they don't! 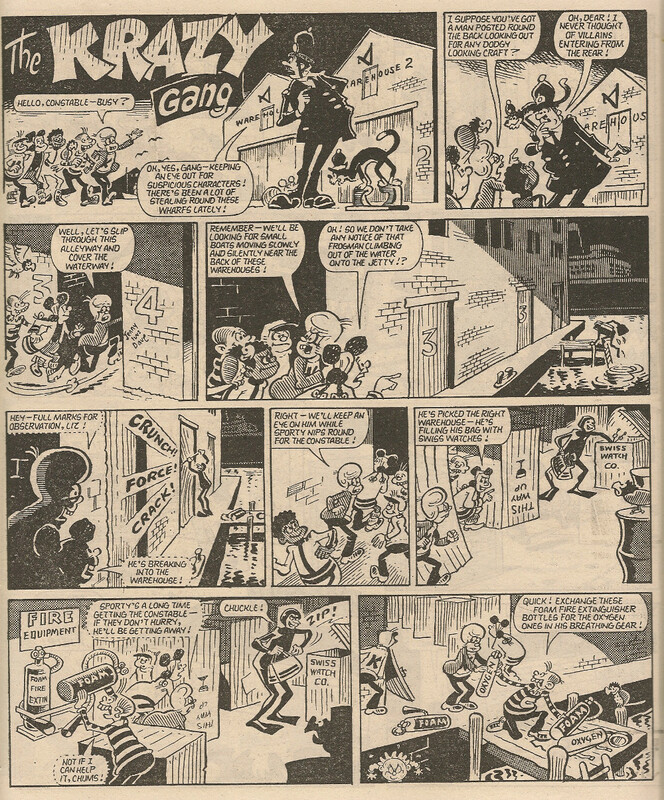 Cacophonous kid Yikky-Boo has Krazy Town jumping on this week's main cover pic (even Snail has been propelled skyward), underneath a banner alerting readers to the presence of part 2 of the Giant Cheeky poster inside. 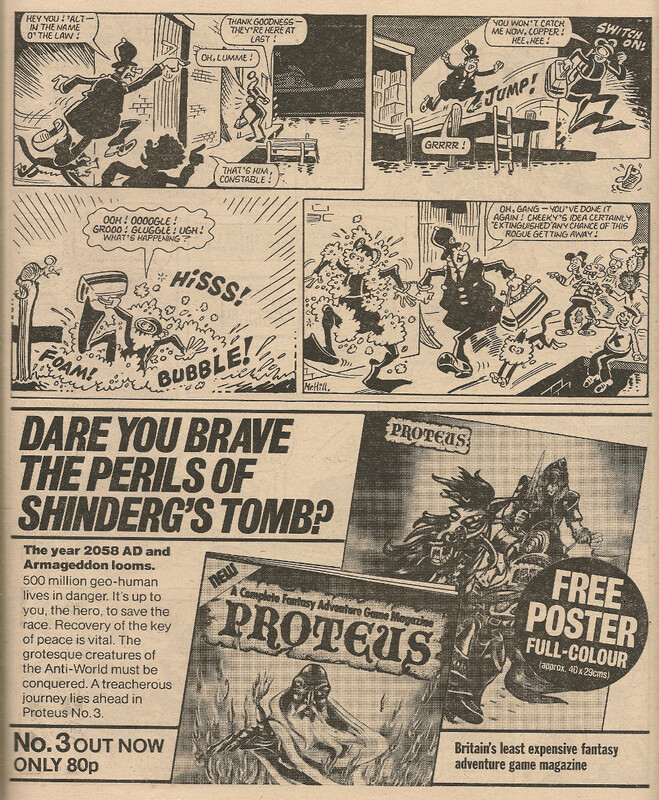 For the first time since the introduction of the 'new look' back in the issue dated 07 July 1979, there is no evidence that the latest 6 Million Dollar Gran episode originally included the now-defunct framing device that was the 'Cheeky-looking-at-end-caption-of-Gran's-TV-programme' closing panel. 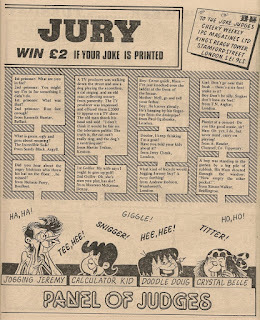 There's a 'bumper panel of judges' standing by to deliberate on this week's Joke-Box Jury two-pager (featuring, as it so often did, some material which would be considered inappropriate today). 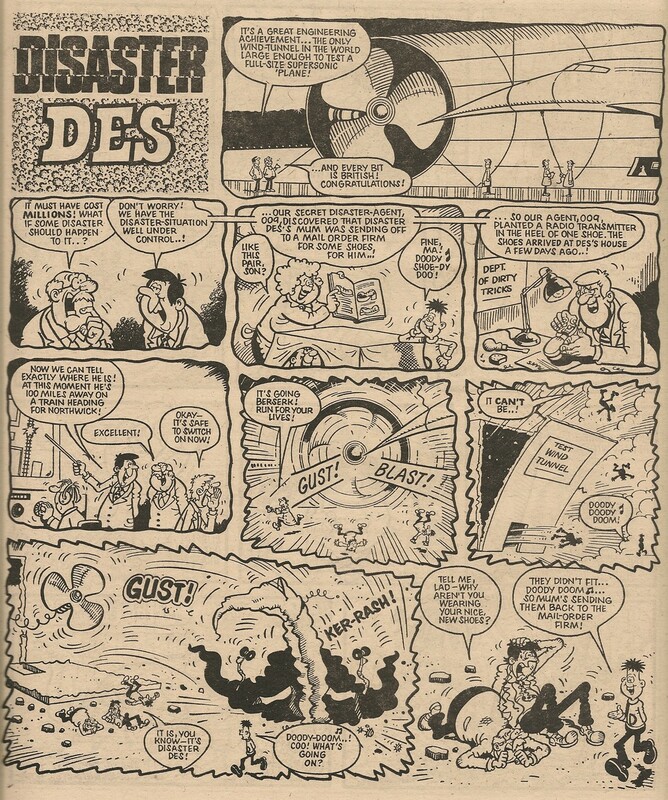 Despite the fact that Disaster Des is under surveillance by government spies the obligatory, satisfactorily destructive events ensue. This week's second instalment of the giant Cheeky poster, occupying the centre pages, features our toothy pal's knee-to-midriff section. 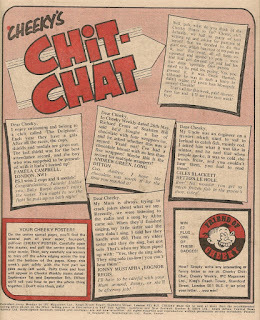 A few pages later, the Chit-Chat feature spans a page and a half (sharing its second page with Tub). 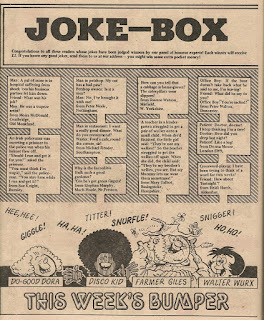 Some cynical readers may suspect that the expansion of reader participation features Joke-Box Jury and Chit-Chat is a ploy to reduce the number of comic strips. 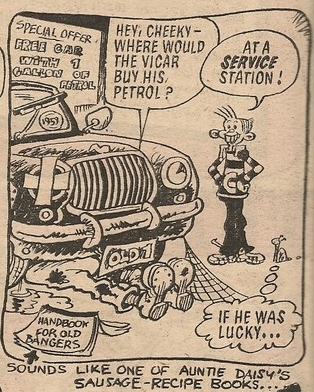 On Friday Snail proves he's a keen observer of global events with his pithy comment on a Cheeky/Mechanic gag. 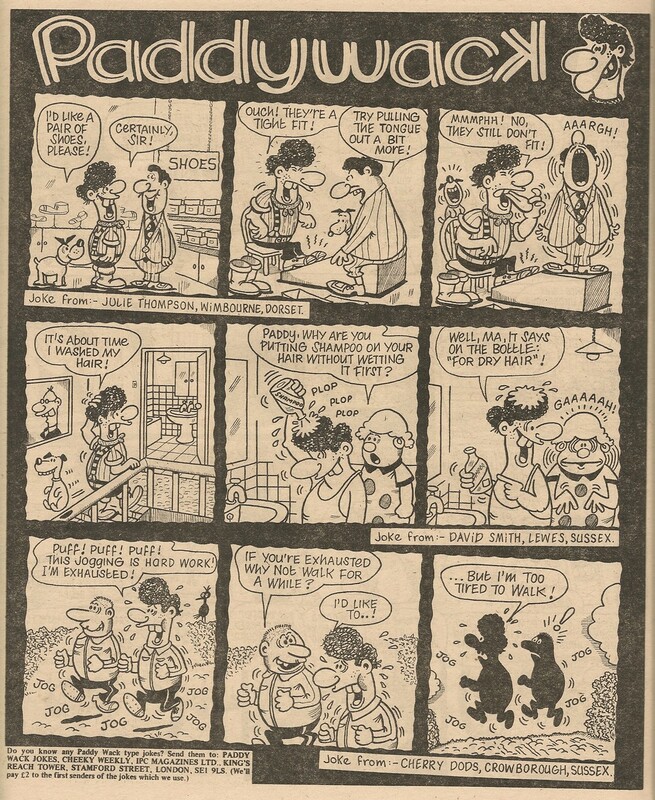 There's more reader participation (but this time featuring attendant cartoonery) on the Paddywack page. On Saturday, Cheeky and pals frantically try to conceal themselves from Do-Good Dora who, as always, is seeking to raise funds for her latest cause of choice. 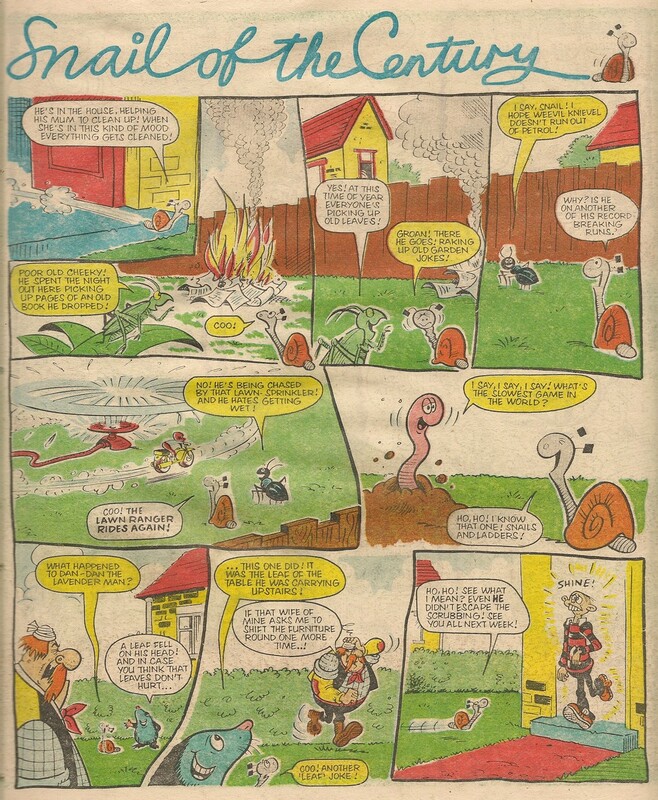 The back cover is once again the location of the garden gagfest that is Snail of the Century, bringing the comic to a close for another week. 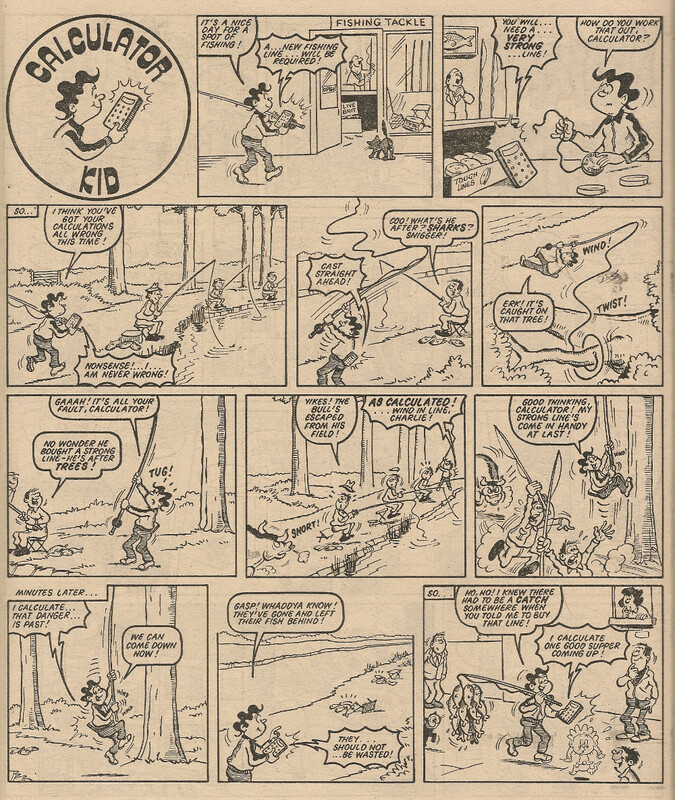 Frank McDiarmid delivers 6 Cheeky's Week elements in this week's issue, with 3 elements originating from the artistic collaboration I refer to as Frank McDiarmid pencils. 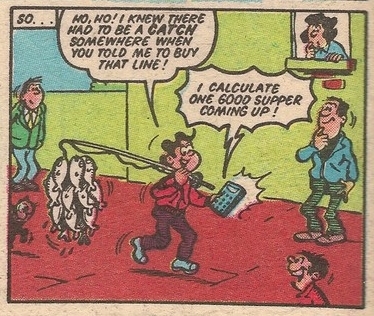 This tale of questionable morality (since Calc knew in advance that the bull would escape, why didn't he get Charlie to alert the farmer, instead of waiting for the beast to rampage and then instructing young master Counter to steal the fish?) first appeared in colour in Cheeky Weekly dated 22 July 1978. 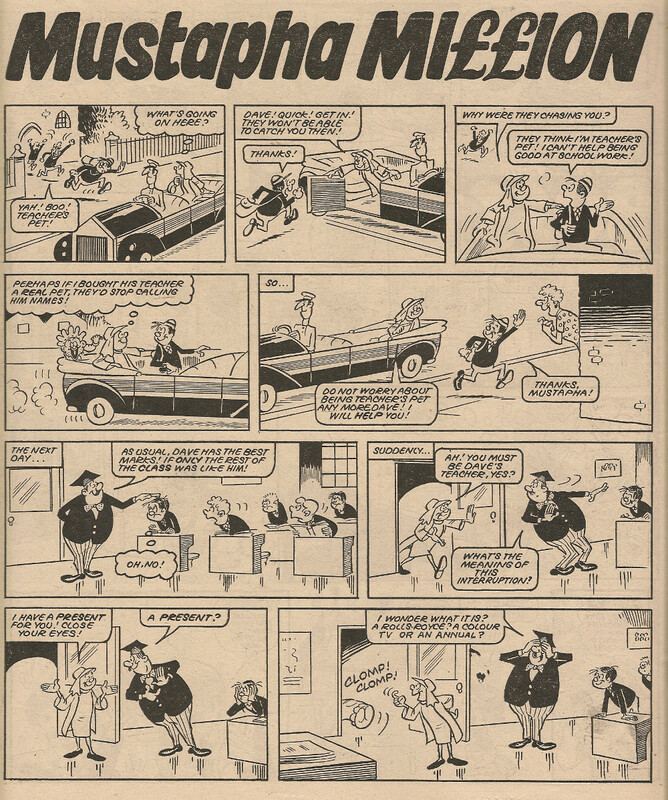 This MM story originally appeared in Cheeky Weekly dated 02 June 1979. 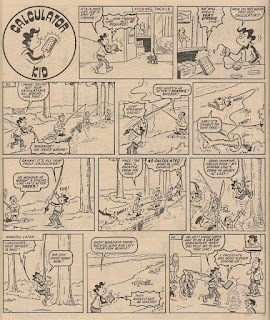 On its original appearance, teacher's word balloon in the final panel on the first page made reference to a 'Cheeky Annual'. 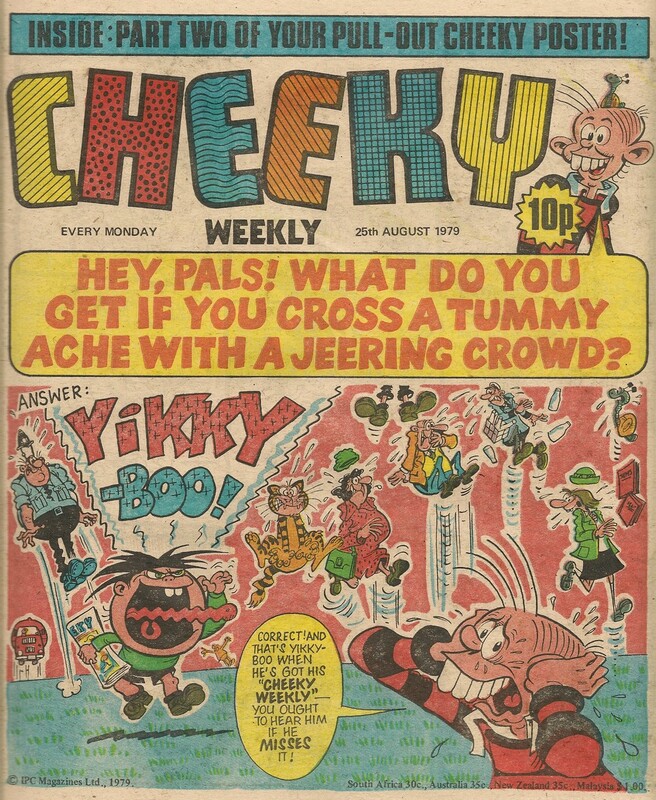 Despite Cheeky Weekly having come to an end in February 1980, Cheeky Annuals continued to be published for some years (each edition cover dated, as was the tradition with all Fleetway annuals, a year in advance). 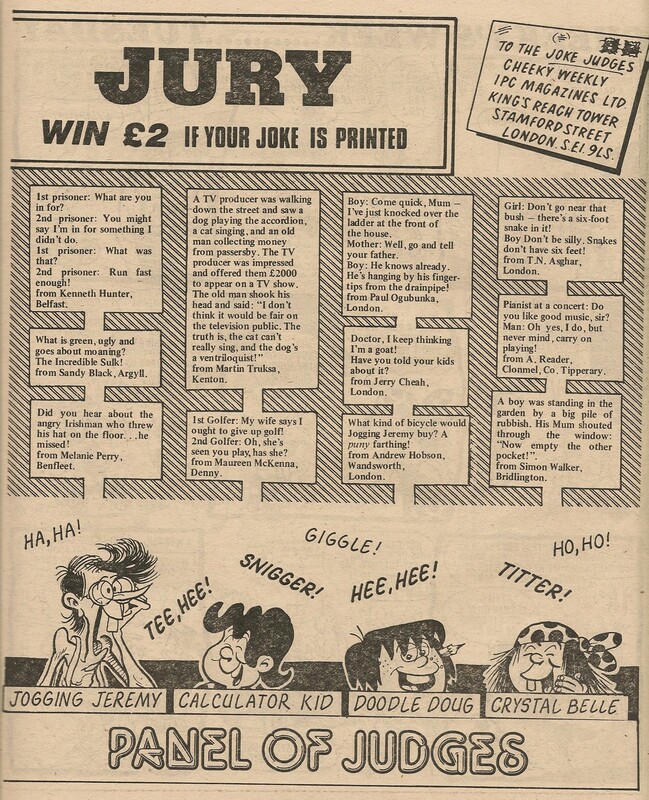 The final Cheeky Annual was dated 1985, so sadly the toothy funster's yearly treat was not among the annuals filling the newsagents' shelves when Whizzer and Chips dated 23 November 1985 went on sale. The tally of raids now stands at Whizz-kids 12, with 6 raids carried out by ex-Cheeky Weekly characters. 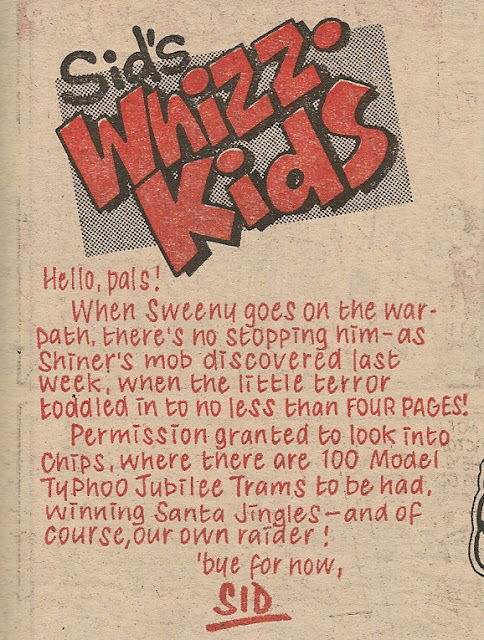 In case anyone's wondering, in addition to his raids on the three surviving characters from Cheeky Weekly, Sweeny's fourth raid in the issue in question was on Lolly Pop. I have a confession to make - I prepared the scans for this post some months ago. When I came to write the post I realised I had forgotten to scan the second page of Mustapha's story above. 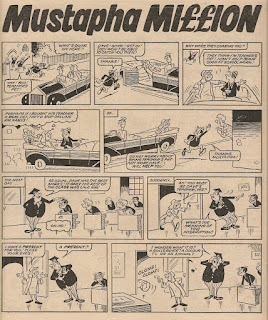 I didn't feel like embarking on a major excavation to retrieve the Whizzer and Chips in question, so the second page shown above is actually from the story's original appearance in Cheeky Weekly - the eagle-eyed among you may have spotted the 'CHEEKY 2.6.79' in the bottom right corner. 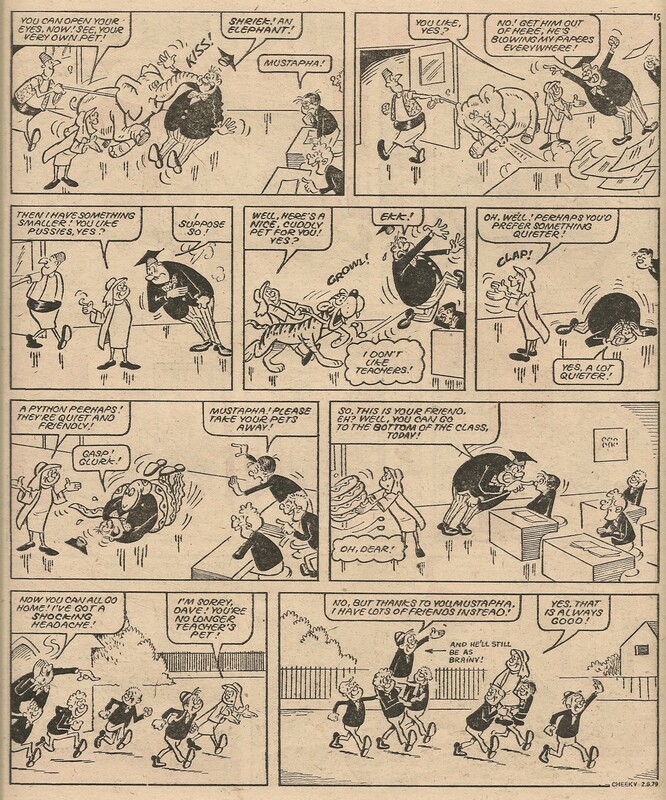 Prior to writing my post on Snail of the Century I had believed that all the SotC strips were drawn by Frank McDiarmid. 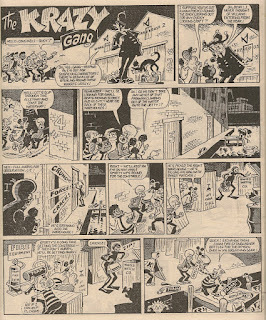 However while re-reading the series for research purposes it became apparent that artwork on one of the episodes was by Barrie Appleby, while a second was probably by Barrie rather than Frank. 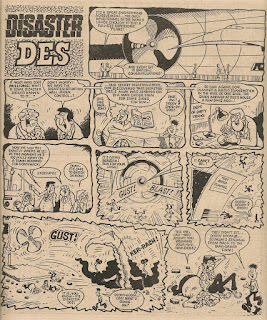 This one (from the following week's issue) is less obviously Barrie's work but I reckon the book pages in panel 2, the building in panel 3 and Dan-Dan in the final row are sufficiently Appleby-esque for me to make an attribution - it's a bit hard to use the manner of Cheeky's rendition to determine the artist, as the toothy funster is depicted as being uncharacteristically groomed, gleaming and not a little shocked by the whole cleaning experience. Snail had been Cheeky's faithful (but silent) slimy sidekick since issue 6 of Krazy in November 1976, but over two and a half years later our mollusc mate was elevated to become the star of his very own feature. 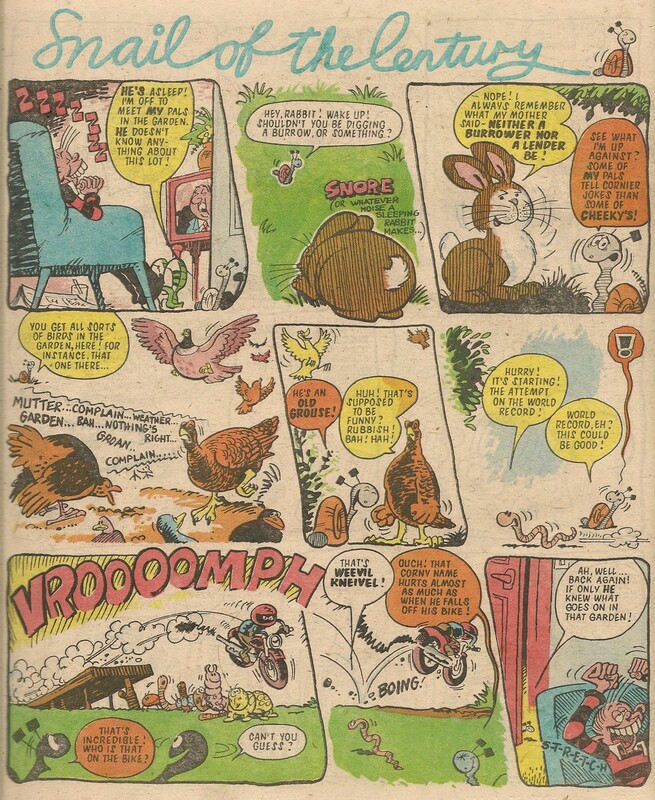 Snail of the Century was the last original strip to commence in Cheeky Weekly, making its debut in the edition dated 14 July 1979 and completing the comic's 'new look' which had been initiated a week earlier. 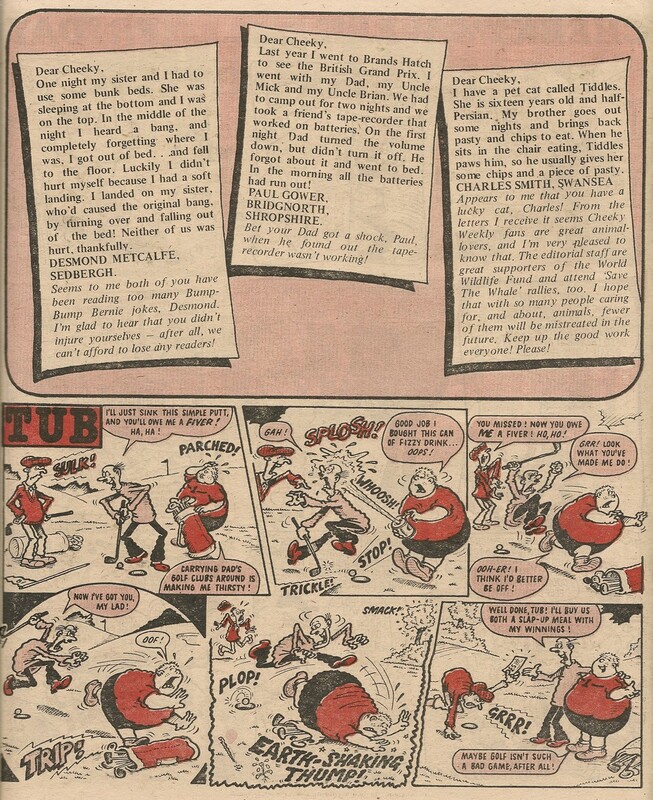 The strip (the title, which had first appeared on the cover of Cheeky Weekly dated 02 June 1979, being a play on Parsonstastic TV quiz show of the time, Sale of the Century) was a spin-off from the Cheeky's Week pages and Snail thus joined Baby Burpo to become the only characters from Cheeky's supporting cast to make it into their own regular strips (The Burpo Special in the case of the notorious nappy-wearer). 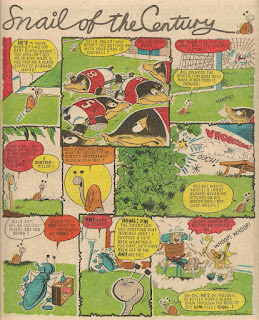 Additionally, both Snail's and Burpo's own features bore titles referencing TV shows of the era. 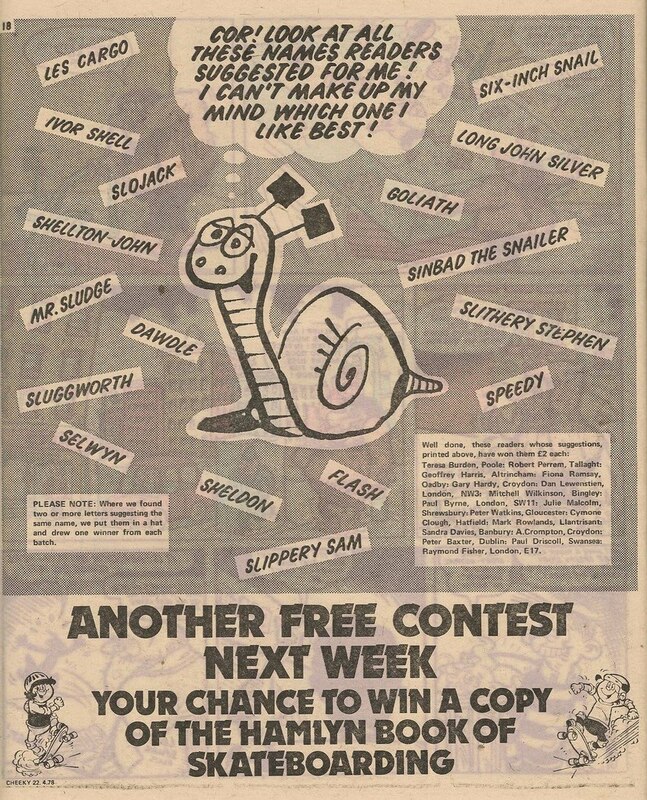 Despite the much earlier competition in which readers were invited to send in suggestions for Snail's name, none of the winning entries published in the 22 April 1978 edition were ever used in either Cheeky's Week or Snail of the Century (seemingly not the first time IPC had neglected to use a name supplied by a reader). 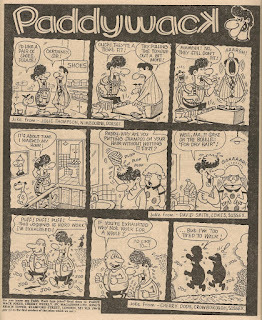 Although the strip was clearly set in Cheeky's universe, there was no introduction within the CW strips, since Cheeky Weekly's framing devices had been dropped as of the aforementioned 'new look' issue dated 14 July 1979. However, there was framing within each SotC episode, as at the beginning of every story the inimitable invertebrate would observe Cheeky's current preoccupation before slithering out into the garden to meet his back yard buddies. The end of each episode saw Snail return indoors to view the latest state of affairs in the Cheeky household. Snail, Cheeky, his parents, Baby Burpo and school gardener Dan-Dan the Lavender Man were the only characters from the Cheeky's Week pages to feature in SotC, and none of the SotC supporting cast appeared in Cheeky's Week. Most memorable among the SotC characters was Weevil Knievel (whose surname underwent a number of different spellings in the early weeks of the feature), the motorcycle stunt rider. The mini motorcyclist (a spoof of course on Evel Knievel) either appeared or was mentioned in every SotC episode. 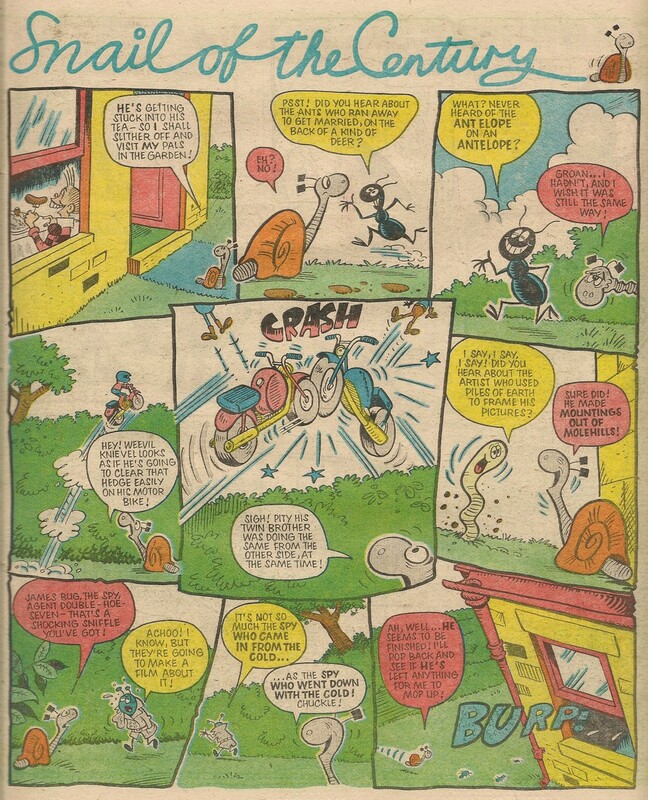 Snail of the Century was missing from just 3 issues after its commencement, appearing in 27 editions in total. 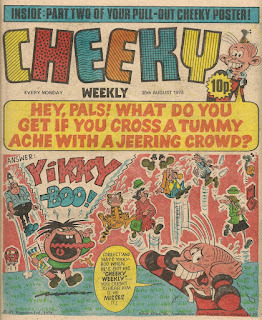 The feature was most often to be found on Cheeky Weekly's back cover, benefiting from the colour printing available in that location on 25 occasions. 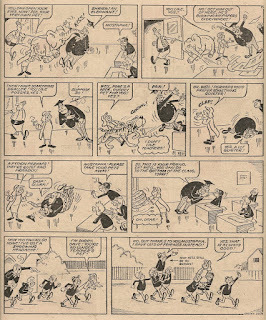 Frank McDiarmid drew 25 episodes, with Barrie Appleby supplying 2. 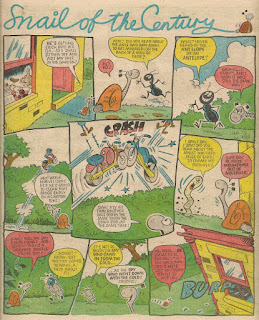 I mentioned above that Snail of the Century was a spin-off from Cheeky's Week, but really it was more like a knock-off. 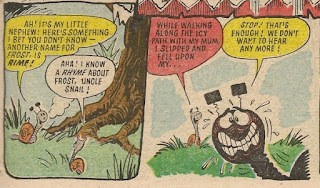 It attempted to relocate Cheeky's pun-fests to the back garden, but sadly Snail, while a great sidekick, didn't really have the personality to front a strip on his own. Having no arms or legs and only a rudimentary face meant the star of the strip was visually a little dull. 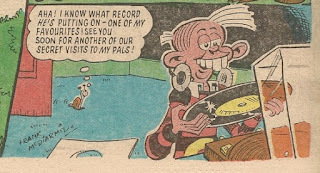 Nor were the mirthful mollusc's mates as engaging a bunch as Cheeky's pals. 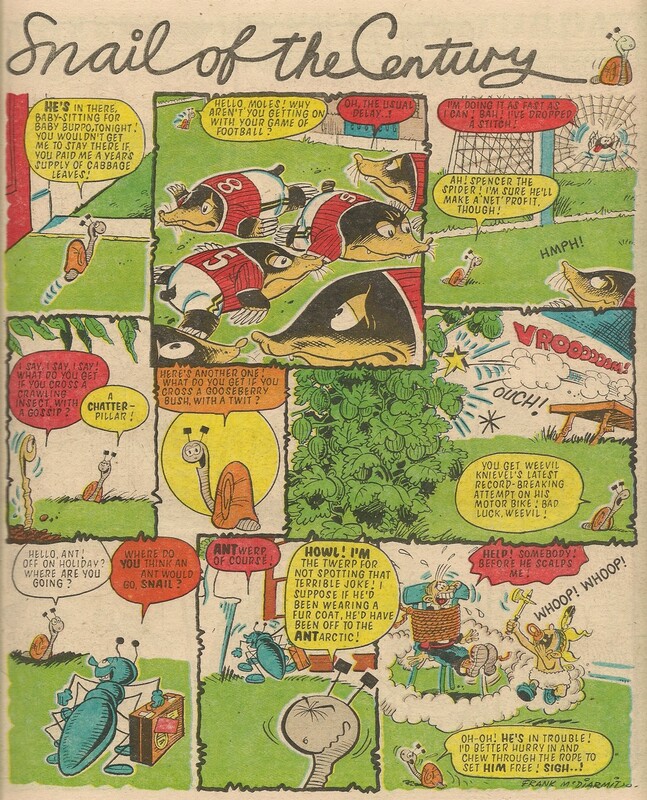 Not being a fan of anything with more than 4 legs or lacking a backbone, the strip never really appealed to me. The Great News For All Readers! 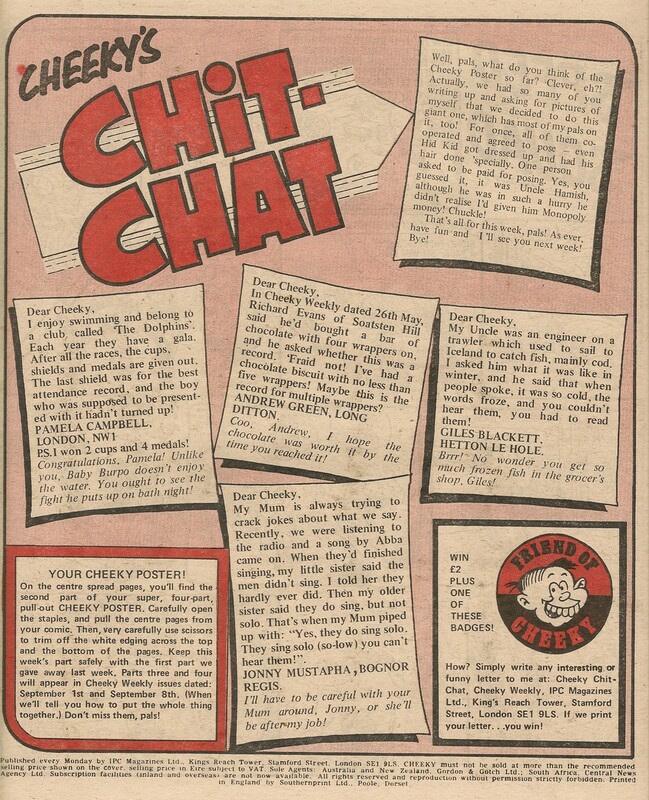 blog is taking a close-up look at the final issue of Cheeky Weekly.